Just like painting! 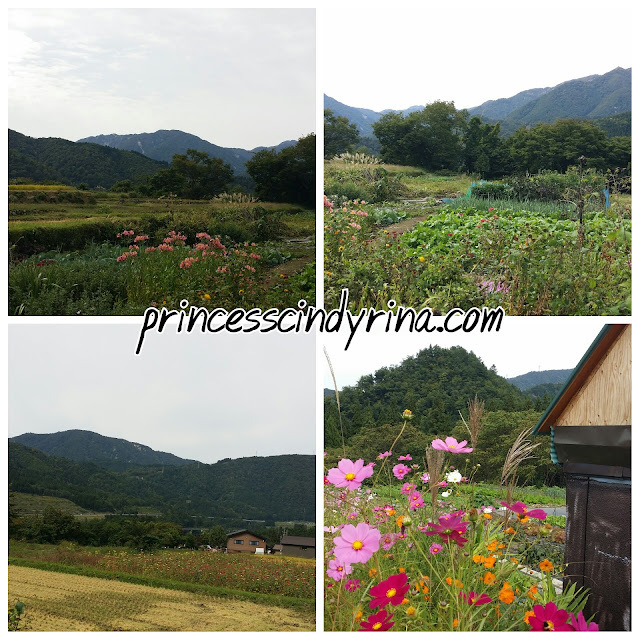 Lovely house with golden readily to harvest rice field and beautiful cosmo flowers dancing lively. 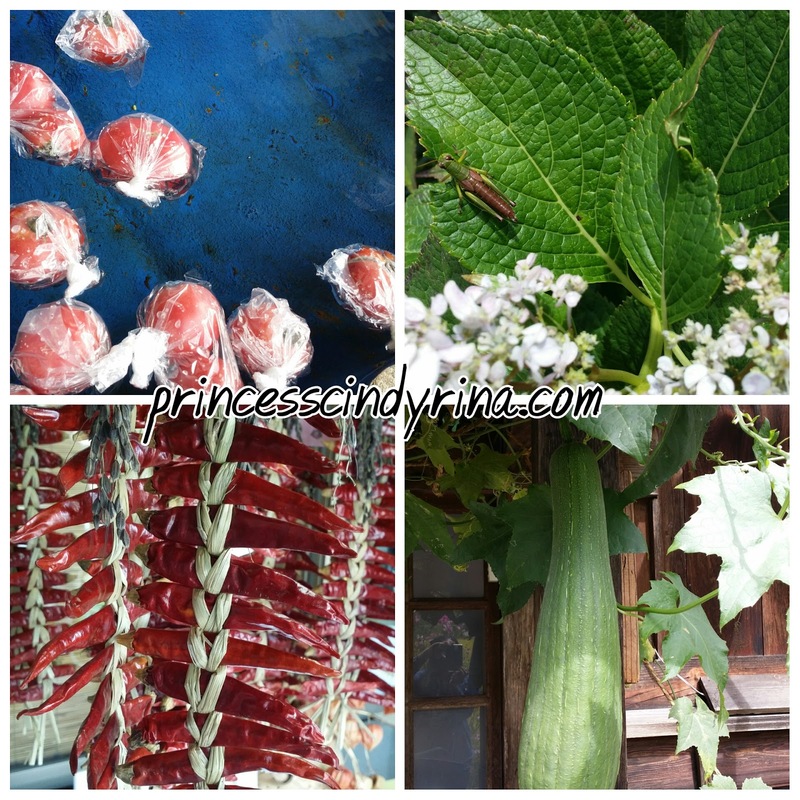 Smells of fresh air, green vegetable farms and fish ponds readily to accept the life cycles on earth. 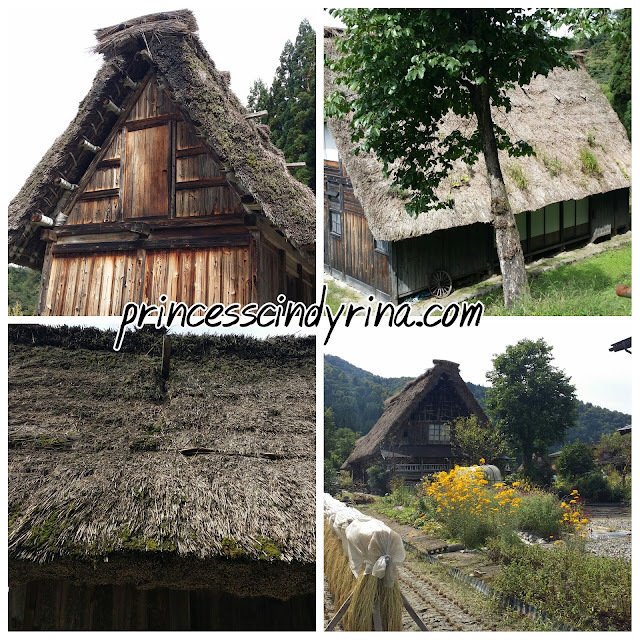 Shirakawago has kept the village unspoiled and well preserved for centuries. This area of steep thatched roved farmhouses gained UNESCO World Heritage Site status in year 1995. 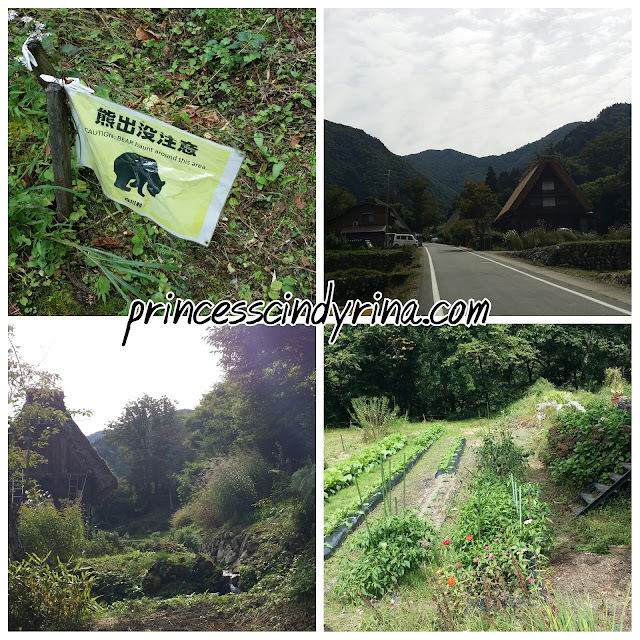 How to go to Shirakawago by bus from Kanazawa? I took Highway Express Bus. - Total journey to Shirakawago from Kanazawa is around 1hours and 15 minutes. Buy the map from the tourist information center 100 JPY. Then enjoy the walking guide from the map. Cross the bridge to get to the village. 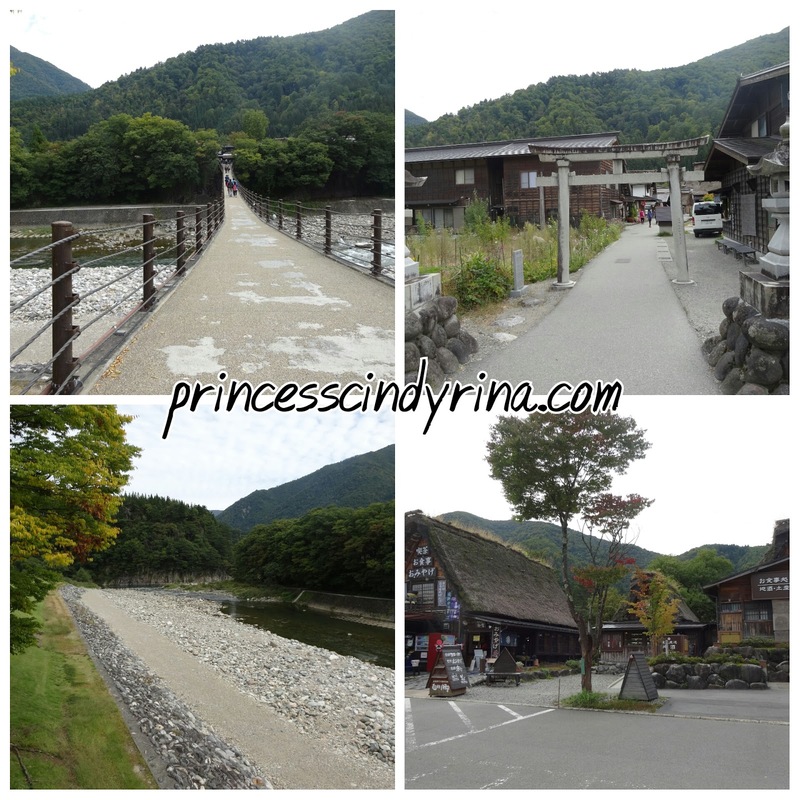 Just walk around and enjoy the beautiful view of this village while taking a deep breathe of fresh air. The people of these Gassho-style or "Praying hands" style farmhouses were cut off from the rest of the world for a long period of time and survived the harsh winters through the cultivation of mulberry trees and the rearing of silk worms. I visited Wada house which history way back since year 1573. Just pay some entrance fees which I am not mistaken around 300 JPY. 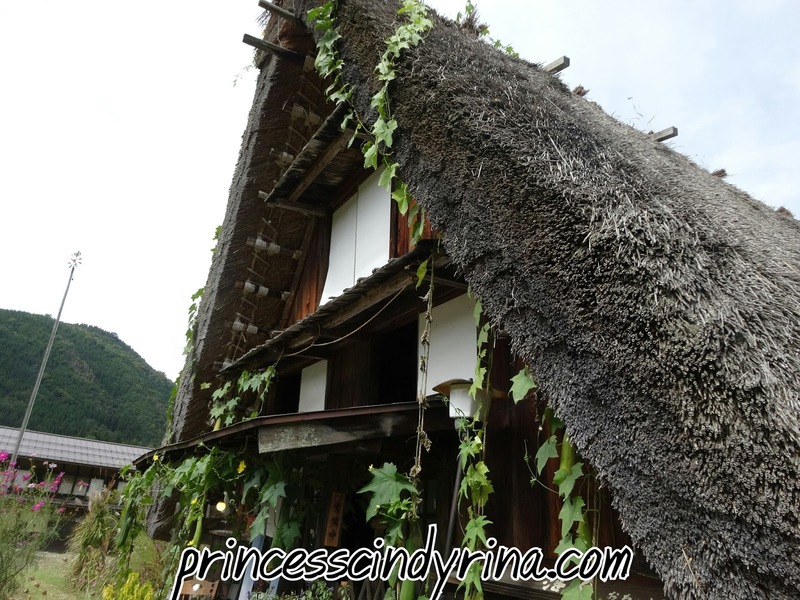 Wada family assumed the role of headman during Edo period and was official at the guard station. This family prosper from its potassium nitrate business. In 1888 Yaemun Wada was appointed the first mayor for this village which make Wada house is the largest of Gassho Zukuri settlement in Shirakawago. mmmmmm.... rich people 's house le. 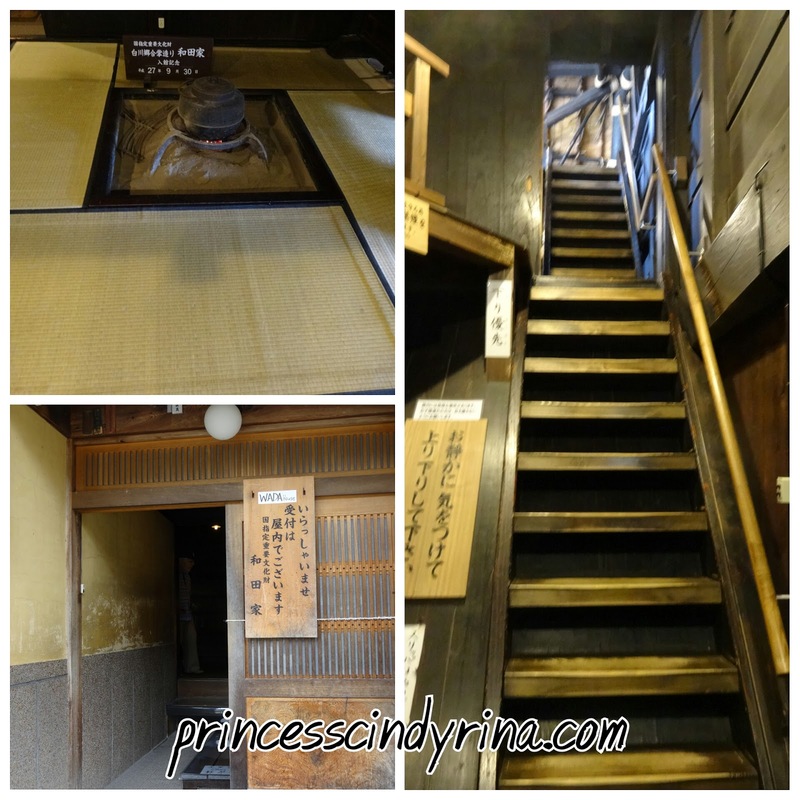 Stepping into this house, one can feel and smells the Edo period sense. 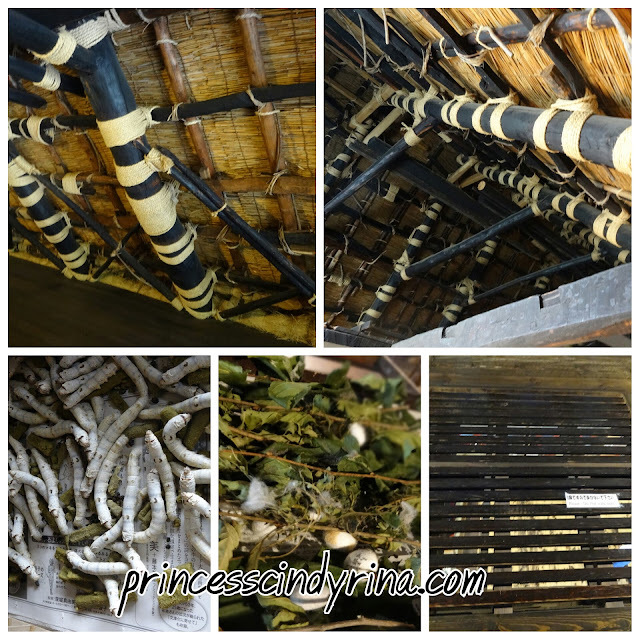 The shiny black ceiling shows how many hundreds of years passed which people lived and earned their livelihood in this place. The horizontal timbers are tied to the sloping vertical timbers using branches of the mansaku tree known as neso. One thing about this type of build up, the roof of Gassho Style house is flexible enough to move with natural forces such as strong wind. Sigh!! who can win the natural forces? Since I am always bad at reading the map. Serious, most of the time I just follow the crowd even one or two people to gain confident that I was at the right place. This time...haihhhh...where were all those crowd??? No time to waste! Just walked as I like and end up at this kind of routes. Damn it! I need to watch out for bear some more. OMG! Nervous! 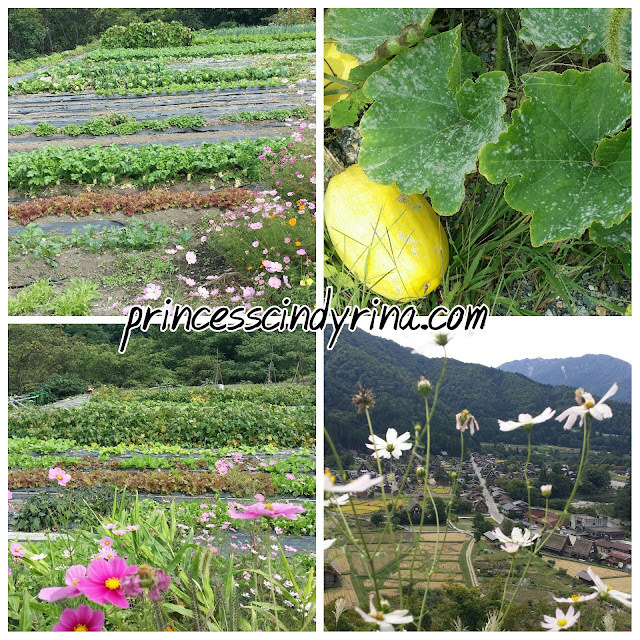 at the same time enjoy the vegetable farms view in front of me. Lovely view! Nobody walked this way though. mmmmm....tried to stay positive. Bad : Did I get lost here? WTH! The more I walk, the view getting better and better. I just can't stop appreciating the beautiful scene in front of me. Thank God! I found my way. Its just I took a very long detour else where and found better view than other people. 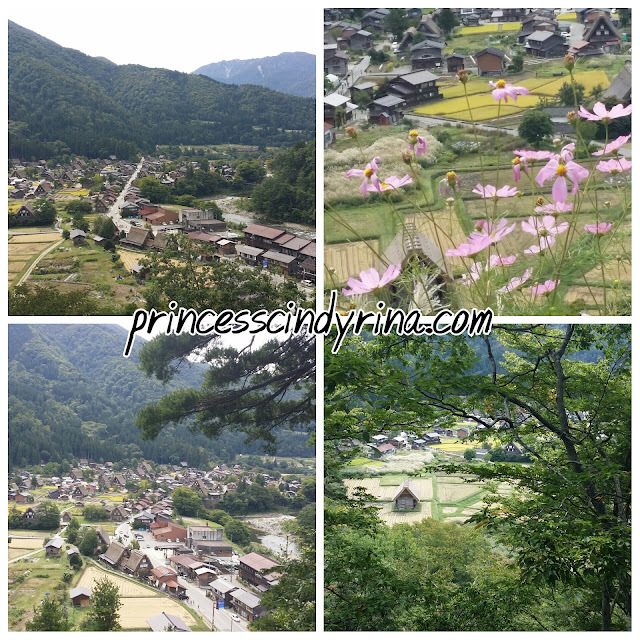 Although Shirakawago is designated as World Heritage Site , it is also a living village where people spend their daily lives. So...for us visitors, please respect other people living space. I think I walked longer than other people since I use the toughest routes. WTH! I then found one of the house selling fresh tomatoes from farm. I bought one for 200 JPY. Even a tomato feel so delicious in this environment. Oh Gosh! That beautiful hanging chilies to chase away evil spirit! This is one of the cafe sells coffee, red bean soup and rice cakes. I love the cafe so lovely! But so many people in that small cafe. I cannot enter pack small space . Afraid I cannot breathe! Phobia! I just adore this place from outside. Imagine this is cafe make from cookies and candies. Like the one in Hansel and Gretel story book. Nice eh? Since I planning to stop at Takayama later which means long way to go....I better grab quick bites. 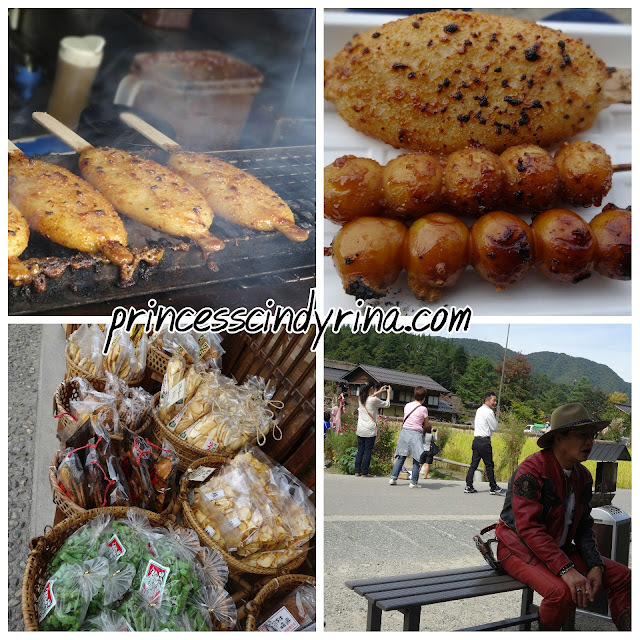 I found this stall selling grilled rice cakes and dango in soyu right across the 'hansel and gretel' cafe. Yummy!!!! Bottom right : Lost Cowboy at Shirakawago! This is what I say touring in style. I saw he have gun with him too. WTH! Time to say goodbye to this beautiful place.I spend half day enjoying the beautiful view of ancient and nature. I really wish this is well preserved till the end. 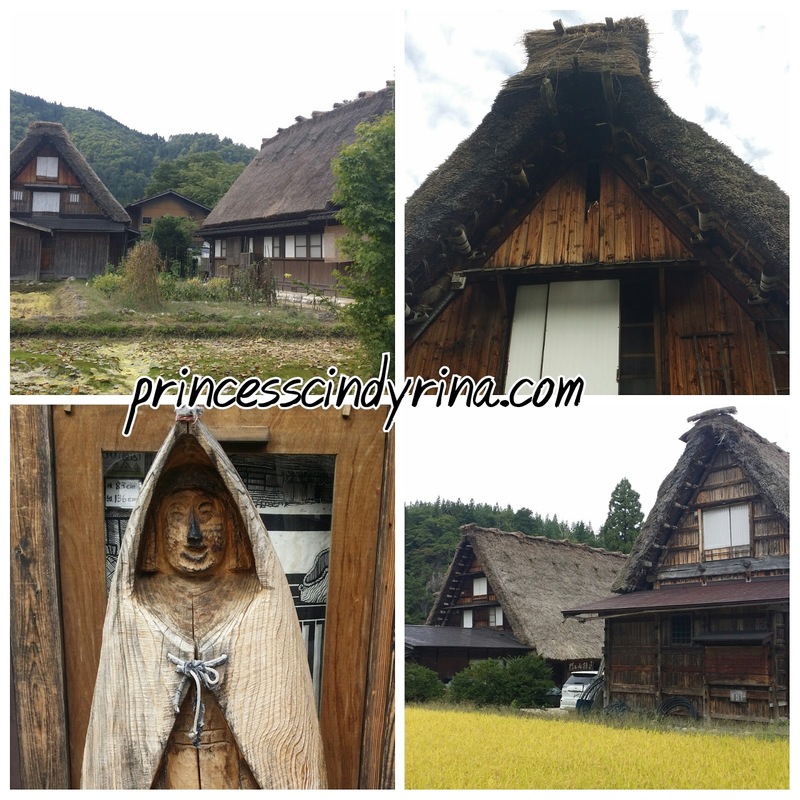 With its old Japan atmosphere, Shirakawago is beautiful anytime of year but many say the best is in autumn and winter. To me, wondering around this place is like walking into the fairy tale book, I read during my younger age. I then took the bus to Takayama and explore another site of Japan. Check out next post! 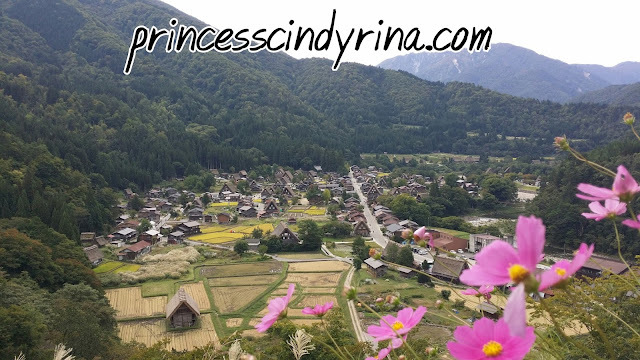 Few of my readers message me for my Japan itinerary. Don't worry! I will summarize everything in my last post by end of next week. I wish I can travel to Japan!!! Nice view!!! 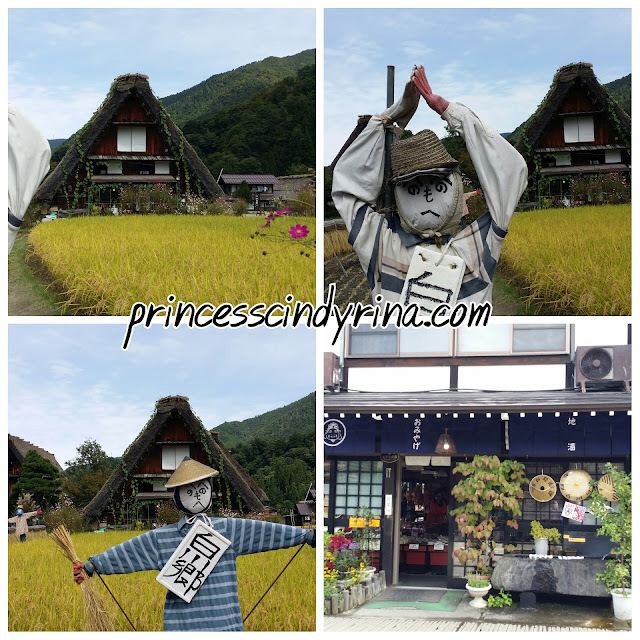 The country side look so refreshing, always wanted to wear a japanese costume and walks along the little villages and pretend I'm a Shogun..... life long childhood dream thanks to the 7 Samurai. You seem capture a lot of pretty scenery although you lost.. A brave girl to explore a new place by yourself. How long your trip for this place took you? Seronoknya dapat pergi jepun, bunga dia cantik sangat. cindy doakan saya dapat pergi jepun next year, hopefully bonus dapat cover the kos ! To really know a new place is to get lost while exploring it actually. But you managed to captured the great views that nobody else captures. 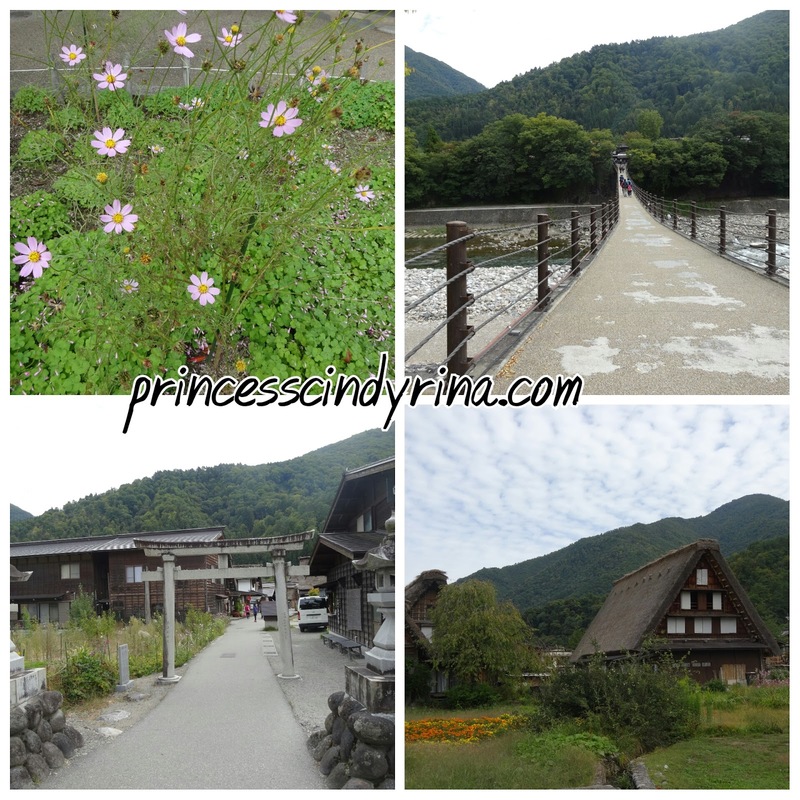 And I am so amazed at how great the authenticity of the village looks. Perhaps we should also have such conservation of our heritage too, like the one in Kampung Budaya, Sarawak. Another great guide from you. I can't wait to plan my own Japan trip. Saving money still. wow nice, did you follow tour to go? or buy own package to go there? No see you write on how much spend for this trip. I love the house there as very unique. Got long bridge somemore. Must be fun holiday at such place. 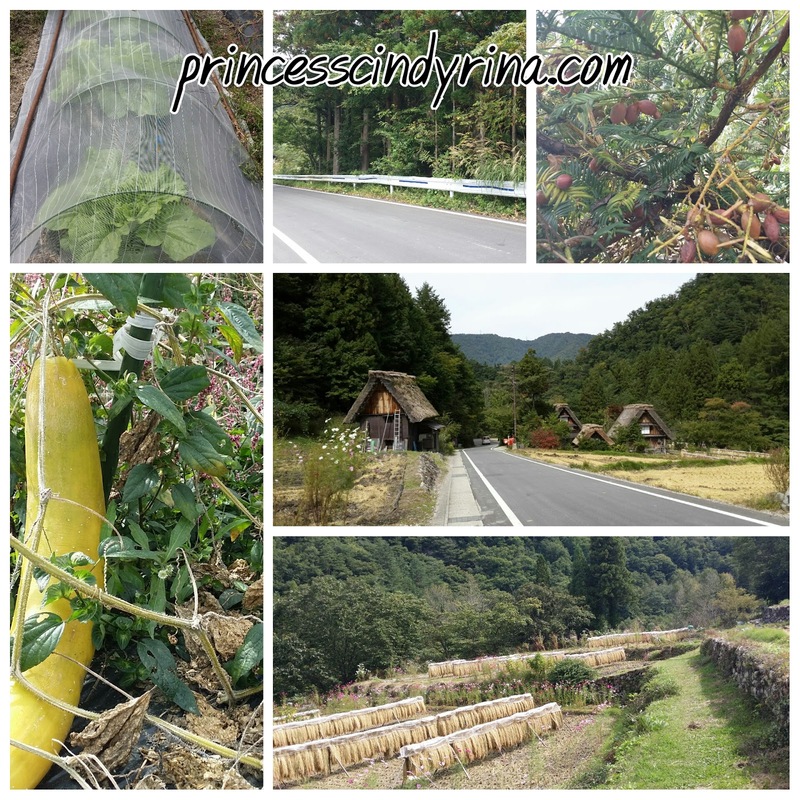 Wow, how you can find all these amazing place in Japan? You're following tour or going by ur own? Beautiful! My friend also paid this place a visit last week. Indeed, everything there is so breathtaking. 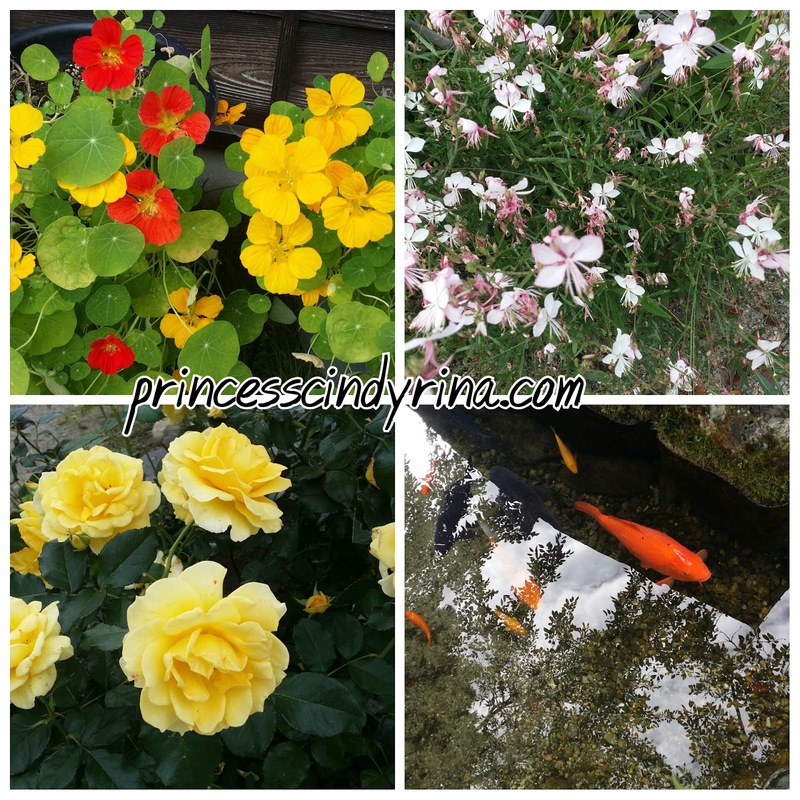 I like the scenery with flowers. Hope to go there one day. It looks like it would be a nice and peaceful place away from the public. Interesting! I can't move my eyes away from those lovely flowers. Like the wooden house too. Hope I manage to visit this place in the future. Admire you can go travel, breath the fresh air and enjoy nice view at Japan. Hope to read more about your Japan trip, maybe I can refer when I go Japan travel. This place is so beautiful. Not sure why but it reminds me a place I went at Taiwan. They have similar garden like this. all nice photo capturing !! japan sceneric was so attractive. Japan is such a beautiful place and on my list to travel soon. Want to see cherry blossom.